What Makes a Good Portable Fish Finder? Finding fish out on the open water with no cares and nothing but your boat – that’s the real dream isn’t it? However, murky and weedy waters can really get in the way of your fish finding goals. Luckily, fish finder devices are available in all kinds these days. For those who often hire a boat instead of owning one or for those with various different crafts, a portable fish finder is a great versatile device that can assist you in your yield, no matter what you’re fishing for. In this article, we're going to take a look at some of the best portable fish finders and explain why they're the best of the best. We'll be highlighting what makes each model stand out and discuss the things you must know (and be aware of before buying). Let's get started! When you’re considering a fish finder, you need to think about the three main types of portable devices on the market. You’ll find portable units, castable, and mountable devices, Each has their pros and cons while suited best to different scenarios. The most conventional style, portable setups usually come with some form of carrying case to hold all the accessories, as well as the device. Armed with a mounting base, portable transducer, finding unit, and rechargeable battery, these portable sets are great for smaller boats. Whether out on the open water or fishing in the ice, you’ll find that a portable fish finder is a good addition to your more compact setup. A more modern-day model, this next-generation technology uses smart devices to power the unit. Castable finders come with a compact floating transducer that talks directly with an app on your phone. You simply download the app and communicate via WiFi or 3/4G. A great choice for those closer to the shore, this device isn’t so suitable for fishers going far from home as it is limited by internet signal. A kind of hybrid device, these fish finders temporarily mount to the side of your boat or to the transom. These work with float tubes, unlike other portable fish finders. Again, great for use in smaller fishing crafts. The quality of your picture is determined by the number of pixels across the screen. While you can go for lower-priced options, you’ll often compromise on resolution and the picture will be harder to decipher. When fishing, you’ll find it harder to tell the difference between weeds and schools of fish. A higher number of pixels results in a better and clearer picture on the screen. This gives you more enhanced detail as there are simply more dots or pixels on the screen. Look for at least 240 x 160 pixels or you’ll really struggle to make heads or tails of the image. This is definitely a feature to consider spending a little extra on. Furthermore, as we peak in the technological age, we see fish finders move from black and white to color screens. With some portable devices, the screen is your phone, giving you crystal clear imaging. While black and white screens are cheaper, they’re harder to read. That said, for those on a budget, they’re still a great option. Remember that cloudy or rainy weather may also decrease the efficacy of a black and white fish finder as the image gets blurry. However, you’ll pay more for a colored fish finding unit, but it will be far easier to understand, especially in the sunlight. Additionally, while sunny days bring great fishing, the sun’s glare can make it tougher to see the image on the screen. Look for devices that combat the sun’s glare. An integral part of every fish finding device – even those that aren’t portable – is a transducer, the part that emits and receives sonar waves. Essentially, your transducers call out through the water and then map the objects underneath the surface. The data that’s received from the transducer is decoded and translated to your fish finder unit. While there are different mounts for fish finders and transducers, don’t be fooled by poor products promoting themselves as ‘portable fish finders’ if they do not include a transducer. The fish finding unit only processes the data – you will always need a transducer to produce the data and do the fish finding. In this sense, a good quality transducer is also a wise idea. Transom mounts are the simplest to install, but if you have a bigger boat, you need something with a bit more kick, taking you out of the portable and mountable range. For those with small boats looking for portable fish finding devices, a plastic transom mount will suit the casual angler. Look for something versatile to fit the different boats you might hire. Trolling motor transducers are also an option. For those looking for something a little more heavy-duty, you can always consider transducers with more durable fixings. For those with steel or aluminum hulls, you need stainless steel components, whereas wood or fiberglass boats need bronze housing materials. This is super important to prevent corrosion. The cone angle relates to the width of the beam given out by your fish finder. Essentially, fish finders with wider cones will cover a wider area than those with smaller cones. While this coverage allows you to see further across the water, you’ll find that it sacrifices the sensitivity of the fish finder. The result of this is that you don’t get as clear a picture. It’s kind of like zooming really far out from a picture and the pixels getting distorted. Portable devices tend to come with pretty standard ranges as they don’t have the sheer size to incorporate really high-tech gear. That said, while most portable transducers range from a 16 to 20-degree angle, some of the more high-quality devices can push up to 30 or 40-degrees. Some can even emit several cones to cover more ground. 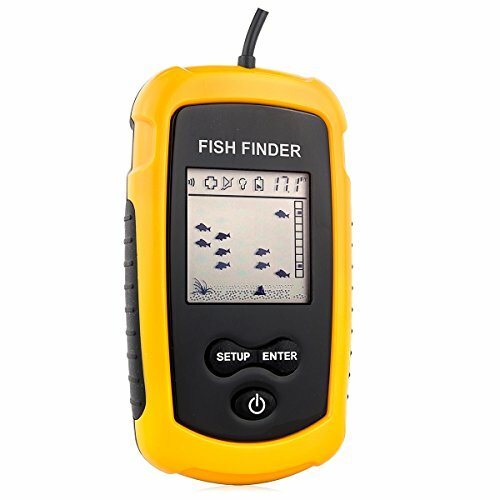 If you’re looking for a fish finder, you’ve certainly come to the right place. Below, we highlight our top six fish finders on the market today. Using our expertise, we’ve broken down each product to showcase their features, their pros and cons, and our overall opinion. If this doesn’t find you a fish finder, it will certainly get you started! 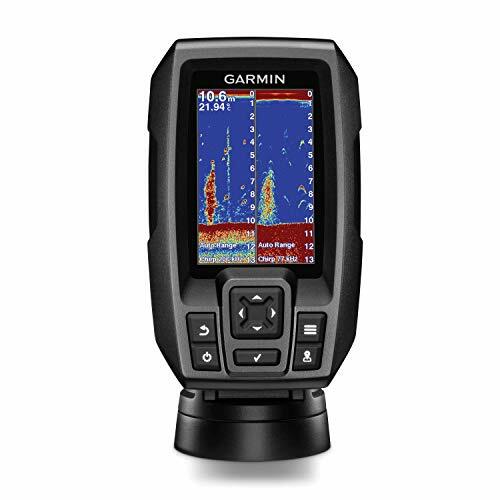 This fish finder comes with a high-grade transducer and features Clearvu Scanning Sonar software. The CHIRP Sonar sends frequencies in a continuous manner for more breadth in information and a sharper focus on the targets. The interface features specific buttons for simplicity, while the model comes available in 3.5, 5, and 7-inch screens. This waterproof device has a waypoint map for marking important points, while the unit has a maximum viewing depth of 1600 feet in freshwater and 750 in seawater. 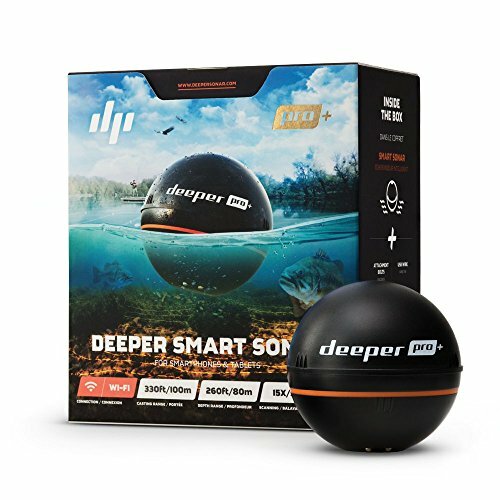 An excellent portable model, this fish finder features high-grade sonar technology, enabling a crisp picture and a clear idea of what’s under the water. The inclusion of a carry case, suction cup, and rechargeable battery make this model great for anglers using various crafts. You may want to double check that it is attached to the boat properly. Luckily, this unit is also waterproof, so there are no worries if it experiences a little spray, whether it be in freshwater or seawater. The sleek-looking fish finder can be used in all weathers and features a high-definition backlit LED screen. The device has dual-channel sonar using CHIRP DownVision sonar, giving two sonar channels at once. 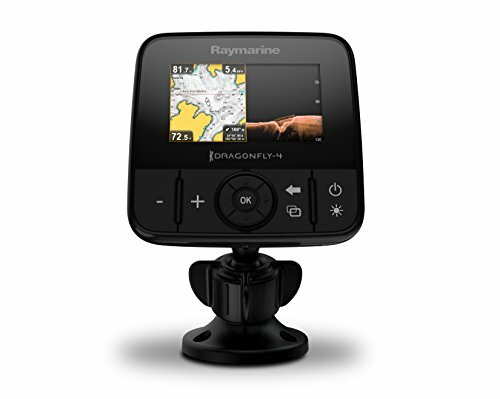 This model connects to your smartphone via that Raymarine’s Wi-Fish app. This is an inclusive transom mount CHIRP transducer, complete with a temperature sensor. Designed to attach to your boat, this fixed fish finder has a very clear picture using CHIRP sonar technology. The dual-channel sonar allows for double imaging, while the connected app enables you to save footage, replay later, and share with your peers. While the unit is sturdy and durable, some people worry about the durability of the mount, so watch out for that! 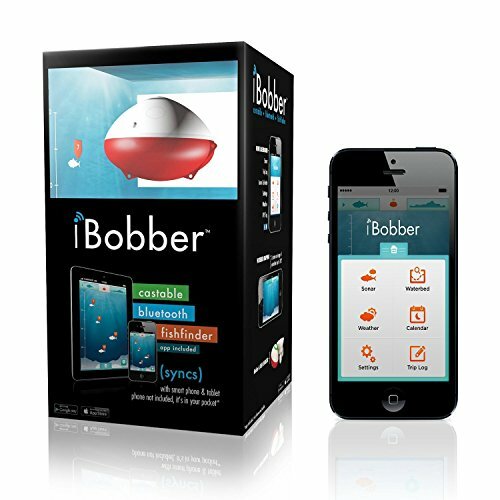 This compact, bobbing fish finder is a great step forward in technology. The LED beacon has a transducer that bobs in the water and connects to your smartphone via the app or Bluetooth. It has a rechargeable battery and an indicator light for low battery. With 10+ hours of battery life, this device has two different swivel connections, enabling this to either bob or work as a remote fish finder. The fish icons on the display are color coded by size, while fish and strike alarms help you recognize schools. The GPS spot tagging feature has an interactive map while the trip log records your locations, dates, conditions, and tackle preparations. Connection to Both Bluetooth and the Internet Allow Access to App, even if the WiFi is down. Very Comprehensive App, Allowing You to Record Data for Future Reference and Share Via Social Media. A great basic tool, this fish finder works with an app for easy use. The app has a whole bunch of features, including alarms that help you see when something is happening under the water. The beacon makes it easy to spot, but it doesn’t connect well to the app beyond 50 feet, making it less useful for shore fishers. Anglers casting close by should consider this, however, as it has a long battery life and variable fixtures to make it a trusty and versatile tool that can be transported easily. This wireless fish finder transmits data to your smartphone and includes a transducer. It has a USB rechargeable adapter and can be attached to your boat. Simple to install, this compact device can be used for ice or boat fishing, and used on your kayak or canoe. This can be used in either seawater or freshwater. This simple device is a great budget fish finder for those starting out. A versatile device, it can be used as an ice flasher, while working as an adaptable fish finder. The connectivity is strong and it works with high-grade software, but the connection doesn’t reach further than 50 yards. With an inbuilt GPS, this floating fish finder boasts some of the highest specs on the market. It scans down to 260 feet with 0.5-inch target separation. Featuring dual beam sonar, this finder shows two images, both broad and narrow. Imaging at 15 scans per second, this device can map the floor structure, vegetation, and animal life, showing the depth and shape around the boat. Syncing to your tablet or phone via WiFi, you can hotspot this device for uninterrupted connection. The ‘Fish Alarm’ isn’t Always Triggered When Activity is Shown on the Screen. 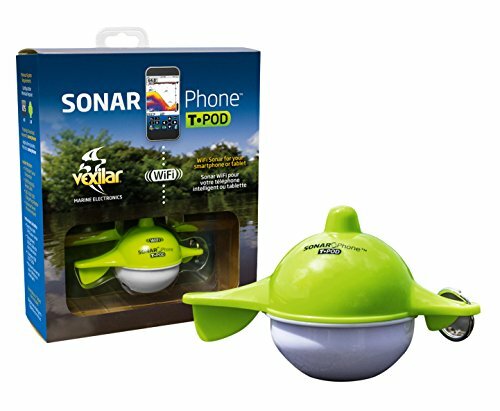 This floating device is great for all types of fishing and is very easy to get going once you get it out of the box. The lack of a wall socket charger is a pain as it slows down the recharging rate, but the low depths it reaches and the crystal-clear imaging make up for this. It can clearly distinguish between different living organisms under the water and provides a strong connection to your phone at all times. The fish alarm is not all that sensitive, but if you’re watching, you shouldn’t miss a thing. This portable fish finder gives information regarding the weeds and vegetation, fish, and structure of the waterbed. This can be used offshore and in a variety of fishing styles (ice, boat, lake, kayak). It comes with a transducer and a 25-foot cable on a removable transducer float. It can detect down to 328 feet and has a two-year warranty. This is a very simple fish finder but it does the job well. With very low depths and a loud alarm, this fish finder really shows you what’s lurking below. With a two-year warranty, this is a great little fish finder for those starting out. If you’re a newbie to fish finding and you’re trying to get to grips with your device, you’ll find the video below to be a handy guide on how to use your portable fish finder. Turn Off the Fishes – The fish symbols on your fish finder are a very dumbed down version of the data that is being picked up. While, yes, it does demonstrate where the fish may be, it doesn’t give you the clearest or most accurate picture of what is under the water. Luckily, your portable fish finder is smarter than its fish symbols, and with that option turned off, you can learn to interpret the data in a more complex and elaborate manner. Keep the Other Auto Functions – While the fish symbols are very childish, you’ll find the rest of the default settings to be satisfactory on the whole. These settings are designed for beginners and will provide you with a pretty clear image from the get-go. Peaking the Transducer – Sometimes the automatic functions experience glitches and send out funky signals. If this happens, your equipment needs some tuning. Peaking the transducer is the process of setting the sensitivity to the right place. You do this by changing the range, always making it at least three times the depth. Next, we take off the automatic option for the sensitivity. Increase the sensitivity level until you see a second line appear at the bottom of the screen. Then you can reduce the sensitivity to filter out the noise or clutter in the image – but keeping your bottom reading. This allows you to see a good image of what is happening under the boat. Reset the Range – Remember to reset your range after peaking the transducer, putting it back to where it belongs. Zoom, Zoom, Zoom – The zoom features allow you to get in closer to your fish. It beams into a tighter space, which enables you to see fish up close to examine the school. This saves you from tearing forward for a bunch of weeds! Fishing is a relaxing experience, rewarded by the sights, sounds, and smells of the great outdoors. While it feels good to live like men once did, introducing a little technology can’t hurt your chances. This is especially true if you’re fishing in murky or icy environments. Portable fish finders give you a great picture of what’s happening under the surface, while also allowing you to easily transfer them from boat to boat. Suitable for kayaks and shore fishing, as well as open water angling, portable fish finders are a good choice for casual anglers and those with smaller boats.